On Sunday, June 10, 2018, Rev. 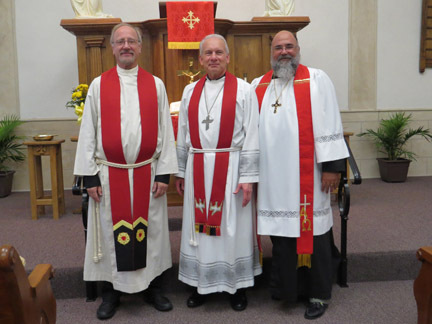 Thomas Schoech (pronounced “Shek”) was installed as an Intentional Interim Pastor at St. Paul’s Lutheran Church in New Melle. Rev. Schoech is expected to be at St. Paul’s 1 to 3 years. It will be his mission to help the church grow and strengthen for the future. A carry-in dinner/reception followed the installation service. L-R: Rev. Dr. Paul Raabe, Newly Installed Intentional Interim Rev. Thomas Schoech, and Rev. Dr. Gary Ellul.